Trinidad and Tobago received independence from the United Kingdom on August 31, 1962. Before that, it was ruled by the U.K. Right now, the head of state (person who is in charge of the country) is Ms Paula-Mae Weekes. The head of government (person who is in charge of the government) are Prime Minister Keith Rowley and President Paula-Mae Weekes. ↑ 2.0 2.1 2.2 2.3 "Trinidad and Tobago". International Monetary Fund. Retrieved 2011-02-18. 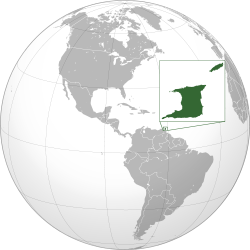 Wikimedia Commons has media related to Trinidad and Tobago. This page was last changed on 15 November 2018, at 07:00.